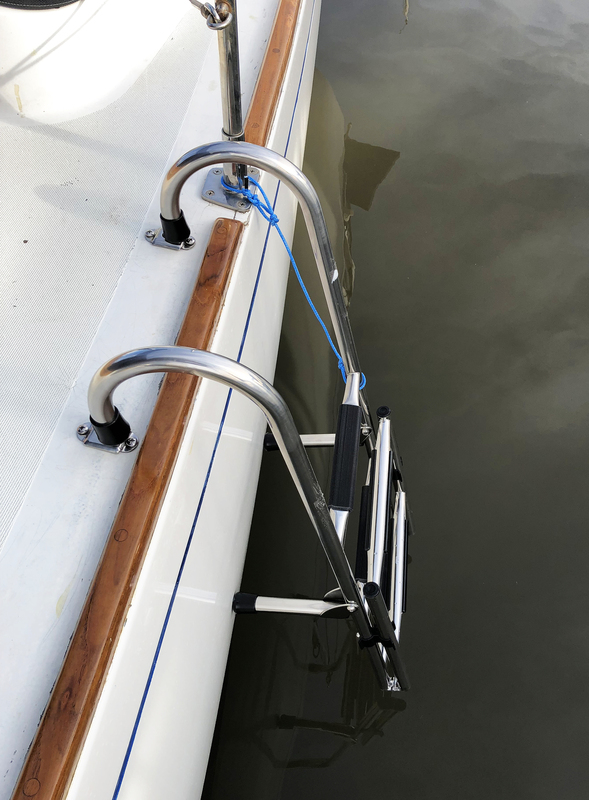 West Marine 5-Step Gunwale-Mount Ladder installed on the author's boat. Over-the-gunwale ladders are commonly used for runabouts and small sailboats. These have hooks that vary in width to match the width of the gunwale. Swim step ladders hang down from powerboat swim steps and usually retract underneath or fold up on top of the step. Since the swim step is so much lower than the side of the boat, these ladders generally need only 1-3 steps. Many ladders fold in half so they can be left in place without dragging in the water. They can be used while folded when boarding from a dinghy and extended when swimming. They are also easier to stow. Rope ladders are flexible, collapsible and lightweight, but they're not ideal as a primary ladder because their flexibility makes them difficult to climb. Try in calm water before you rely on them as your sole reboarding method. Ladders should be mounted so that the steps extend far enough into the water to make climbing aboard as easy as possible and at a spot that's convenient for boarding. For example, stern ladders are quite common on sailboats, but this is frequently where the motion of the boat is the greatest. On sailboats with a fixed pushpit, a better place may be on the side, near the cockpit, where the lifeline gate is located. The bottom of the ladder is just above the waterline, so it stays clean. I have added a keeper line to prevent loss of the ladder. Ladders are made from noncorroding materials like stainless steel, aluminum and plastic. Aluminum is lighter and less expensive, while stainless-steel looks better and is stronger. Plastic treads are fine and are quite comfortable. 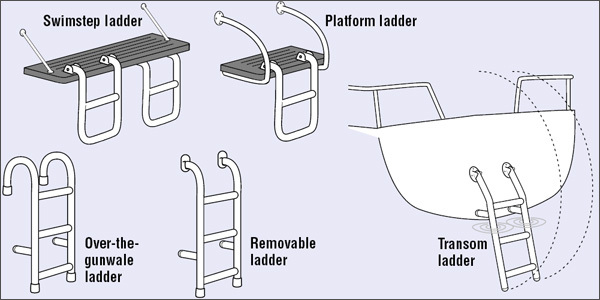 A reliable boarding ladder is an important component of your boat's water fun and playtime equipment. It's also a key crew overboard device, at least in calm water conditions. As an owner of an offshore racing sailboat, I wanted a boarding ladder that could be used with my Lifesling2 in case someone went overboard. The Lifesling2 is a great device for throwing to a person in the water, but getting them back aboard requires either a hoisting tackle, a sturdy boarding ladder or both. My first choice was dictated by affordability, and I chose the Sea-Dog 5-Step Boarding Ladder. Its virtues of light weight, easy storage and cost were overwhelmed by the product's deficiencies. It was extremely unstable and provided zero confidence as I tried to climb out of a kayak and onto the ladder. 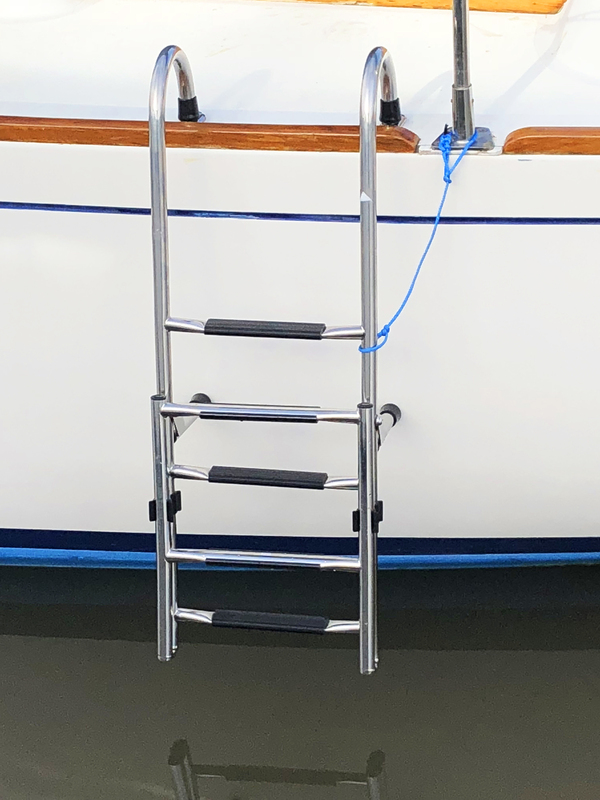 Eventually I bought the West Marine 5-Step Gunwale-Mount Ladder shown in the photos on this page. It is mounted in the gated area of my Cal 40's lifelines. I purchased a second set of the Mounting Sockets that fit these ladders, so the ladder can be deployed on either side of the boat. 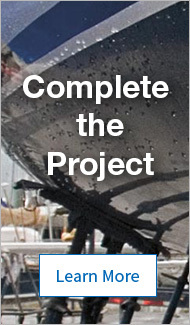 The freeboard of my boat (waterline to deck) is about 36 inches. When my ladder is folded, the bottom is about 1-1/2 inches above the water's surface. Flip it down, and two steps are under water. Notice also my blue Amsteel keeper lanyard. It is secured around the base of the stanchion, just in case the ladder should somehow get loose from the mounting clips.